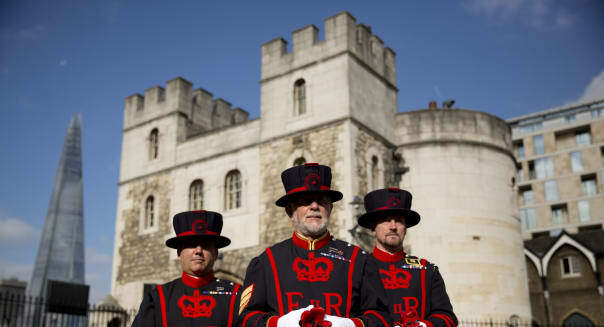 Matt Dunham/APAt the Tower of London, the yeoman warders -- called Beefeaters -- attract tourists. The snow is melting, the birds are chirping, and all around us, spring has sprung. So naturally, it's time to start thinking about summer. Specifically, the summer vacation season, and where you want to spend it this year. America holds multiple possibilities for vacation destinations, from Disneyland to Mt. Rushmore to ... Disney World. (We jest a bit, here.) But to get the most bang for your buck this year, you'll probably want to think about traveling internationally. According to CNBC, "the ruble is down, and the euro is sliding back to levels not seen in over a decade." If this keeps up, vacationing abroad could be the best way to stretch your dollars furthest. And in that case, even though spring just sprang, it's already time to start booking flights. The possibilities are legion. Take Russia, for example. Who wouldn't want to take a tour of the Kremlin, ride the Trans-Siberian Railroad, or see the White Nights in St. Petersburg? And with U.S. dollars buying nearly twice as many rubles today as they did a year ago, Russia's almost never been cheaper. Problem is, the Russians themselves aren't particularly pleased with the devaluation of the ruble, and all too often, they blame us for that. The latest reports out of Pew Research show that only 23 percent of Russians polled have a favorable opinion of the United States -- while 71 percent view us unfavorably. This suggests that despite its current cheapness, a visit to Russia today could prove uncomfortable. Perhaps it's better to visit a country that we like, and where they like us, too? The rest of Europe, however, offers better possibilities. Currently, $1 will buy you 92 euro cents. That's up from about 75 euro cents a year ago -- making Europe, as CNBC put it, the cheapest it's been "in over a decade." So where would you like to go? According to a new poll out of Gallup, the country we like best worldwide is Canada. Americans give our neighbor to the north a 92 percent rating for "overall" favorability. But in decade-cheap Europe, our top three favorite countries are Great Britain, France and Germany -- in that order. Ninety percent of Americans polled view our former Colonial masters favorably, with France and Germany polling positively at 82 percent and 81 percent, respectively. These feelings, however, are not always mutual. Oh, Britons like us just fine -- 66 percent favorable, 27 percent unfavorable, according to Pew Research. And in France, they positively nous aiment -- 75 percent favorable ratings for the U.S., versus just 25 percent unfavorable. Germany, however, is almost evenly split in their opinions of Amerikaner, with 51 percent expressing favorable sentiment for the U.S., but a whopping 47 percent unfavorable. Meanwhile, one possibility that wasn't covered on Gallup's poll of countries that Americans love most (but maybe should have been) is Italy. At 78 percent favorability, it's the single European country that appears to love us best. Final thought here: Now that you know which countries Americans like most -- and which ones are likely to give you the warmest reception on your summer vacation -- it's time to talk timing. According to website FareCompare.com, the best time to reserve a ticket for international travel is "between 5½ months and 1½ months before departure." Meanwhile, CheapAir.com suggests you book even further in advance -- and try especially hard to avoid buying within three months of departure, warning that "about 90 days before departure... the pace of [price] increase starts to accelerate." In which case, the time to start looking for plane tickets for summer travel is... now. So act soon, while these countries are still cheap, and while their affection's still warm. In just a couple of weeks, Motley Fool contributor Rich Smith will be flying off to Austria -- one of the few countries for which Pew doesn't provide favorable/unfavorable ratings. He's not at all certain what sort of reception he'll get. Try any of our Foolish newsletter services free for 30 days, and check out The Motley Fool's one great stock to buy for 2015 and beyond.